Since I’m still buzzing from RT, I thought for my weekly wrap-up post this week, I’d just talk about 5 random things I saw/did at the convention. May this serve as your enticement to attend next year. 2. So many books. SO MANY BOOKS. I won a bag of books at Cinema Craptastique my first night there and only kept the books from it I thought I’d actually read, but just by virtue of being at the con, 10 books (excluding my own books) made their way into my luggage, and I shipped another 6–8. (The box of stuff I shipped home arrived yesterday, but I’m kind of afraid to open it.) I did not purchase a single book, it should be noted. I mean, sure, at the Giant Book Fair on Saturday, I did get the stink-eye from one reader who asked what I wrote, but everyone else was at least open to hearing about my books. There was a ton of enthusiasm for gay romance, actually, particularly at the book fairs. I sold a lot of books at the Thursday ebook expo (more than I was expecting) almost entirely based on the covers snagging people’s attention as they walked by, and some of my books have unambiguously male/male covers. There was a great group of gay romance writers who did attend, so we made a good showing. There were at least 15 gay romance writers there that I can think of off the top of my head, probably more like 20. 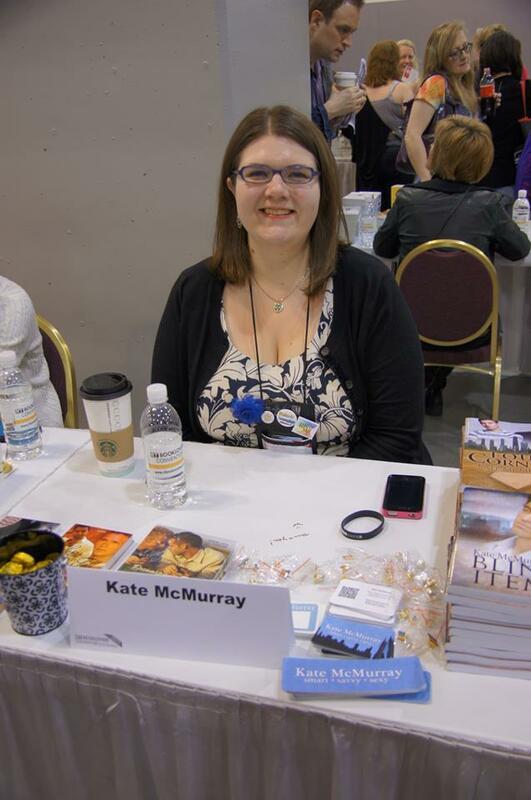 And authors, don’t underestimate the power of just being friendly and respectful at a con. It goes a long way. I met some really cool people there and also got to meet some people I’ve only corresponded with online, and that was really fun. 4. I rode the elevators with some very famous authors, which was kind of surreal. I had been warned that whole book deals go down in the elevators. Cherry Adair complimented my shoes when we wound up in an elevator together, and that was awesome. I was staying on the 25th floor, so all journeys to my room were long and involved a lot of elevator-related shenanigans (I joked on Twitter that the elevators deserved their own Twitter account based on how quirky they were). At a place where romance authors are treated like rock stars (AS THEY SHOULD BE) sometimes, you wind up sitting in the lobby next to EL James or Jude Devereaux and sometimes you get so starstruck you start shaking as you meet one of your idols (not that this happened to me *shifty eyes*). I mean, just as a longtime romance reader, RT was great. Like Romance Disney Land. 5. I didn’t go to as many panels as I thought I would—there was so much on my agenda that I just didn’t make it to—but the most informative panel I went to was on diversity in romance, led by Suleikha Snyder, Jeannie Lin, Shawtelle Madison, and Mina Khan. A lively discussion with the audience ensued in which we talked about how people of color are (under)represented in romance and how authors can get it right. The gist was to write characters first. So, I had a good time at RT. Can you tell? On the flight home, I read an entire Sabrina Jeffries novel (one that I got in one of the, like, 5 gift bags I was handed throughout the week) that I enjoyed. Fluffy Regency romances are my crack, basically. I love them. I read them when I’m feeling blue. I tend to glom on them, reading 5 or 6 in a row. I want to write a gay Regency one of these days. Look, read what you want. If you don’t like Regencies, that’s fine, as long as there are plenty for me to read. And I got a bunch from RT, so neener. Next up on my agenda: BEA!